The texture of travel comes from the people you meet and exposure to the culture of the places you visit. The roots of the old West continue to nourish the lifestyle of today’s people. Ranchers continue to manage their herds, farmers fight to tame the land into productivity. Western hospitality lives up to its reputation. Tourism is firmly embedded in the local economies. We stayed several days at a place that once belonged to Buffalo Bill Cody. His guest hunting cabins are now modified accommodations for tourists. Horse trails wind through the Shoshone National Forest and “Be Bear Aware” signs are everywhere and to be heeded. 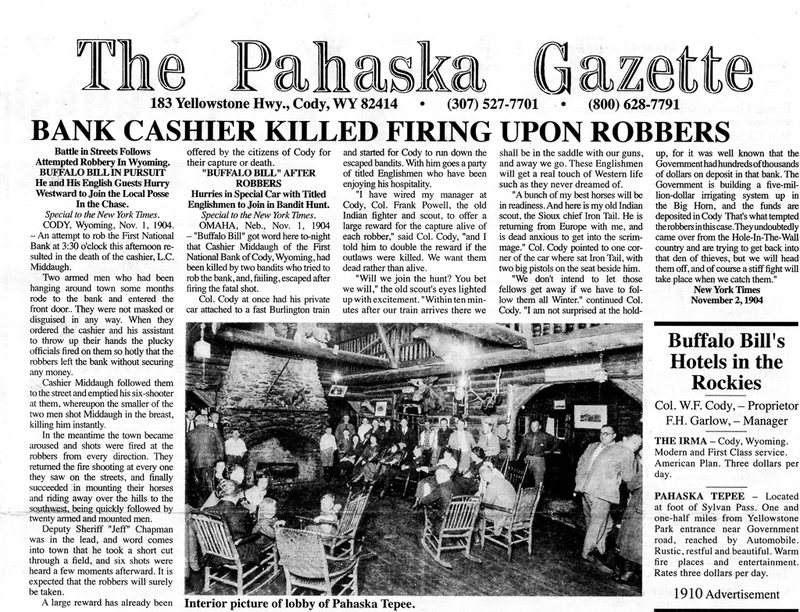 The menu at a local restaurant included the front and back page of a newspaper from 1904 that related a story from that time of history. Today’s robberies tend more toward the electronic than physical. I wonder how Buffalo Bill would have chased today’s thieves? The history of the Yellowstone area has been retained along with the beautiful geography. While it is not possible to stop progress, it is possible to preserve the past. I am thankful that people have done that.